The total market size for organic packaged food and beverages in the UAE in 2017 is US$38.1mn, making it the 34th largest market in the world by value. Per capita spending on organic packaged food and beverages in the UAE is US$4.18, which ranks as the 27th largest spending per capita in the world. The largest company by sales in organic packaged food and beverages is Lactalis Groupe, which maintains 11.3% of total sales. This company is followed by Hipp GmbH & Co Vertrieb KG and Savencia Fromage & Dairy. Organic packaged food and beverages in the UAE will see strong year-on-year growth of close to 10% in 2018. This is slightly faster than the rest of the Middle East and Africa region, which will experience nearly 8% year-on-year growth in 2018. The UAE maintains a market size for organic packaged food and beverages of US$38.1mn in 2017, which is 0.1% of global category sales. Within the Middle East and Africa region, only Turkey, Morocco and Israel surpass the UAE in total value sales of organic packaged food and beverages. The UAE will experience strong forecast growth of sales of organic packaged food and beverages, at an 11.6% CAGR from 2017–2022. Sales of organic food in the UAE have been growing in recent years, but sales of organic beverages remain negligible. Due to high prices, high-income Western expatriates in the UAE are generally target consumers for organic packaged food. Sales of organic beverages are almost nonexistent in the UAE. Organic packaged food sales have posted strong growth rates in recent years, due to increasing awareness and product availability. Parents in particular tend to view organic packaged food as better options for their children. Organic dairy and sauces, dressings and condiments are two of the largest organic packaged food categories in terms of sales value. The organic packaged food landscape in the UAE is fragmented and competitive. Foreign companies dominate the landscape, as the expatriate community, who can afford organic products, seeks out the brands they trust and know from their home countries. Lactalis Groupe is the market leader with 11.3% value share, followed by Hipp GmbH & Co Vertrieg KG with 6.3%. Sales of organic packaged food and beverages are projected to grow in coming years, driven by increasing consumer health consciousness and environmental awareness. The sales value of organic dairy is projected to grow at a particularly strong rate in coming years. Sales of health and wellness products have grown in recent years as the UAEs increasingly urban consumer base has become more health conscious and has more disposable income to spend on products that help them maintain healthy lifestyles. The government of the UAE has invested in public service campaigns warning of the dangers of diabetes, obesity and heart disease, which has led many consumers to opt for food and beverages that are low in sugar. 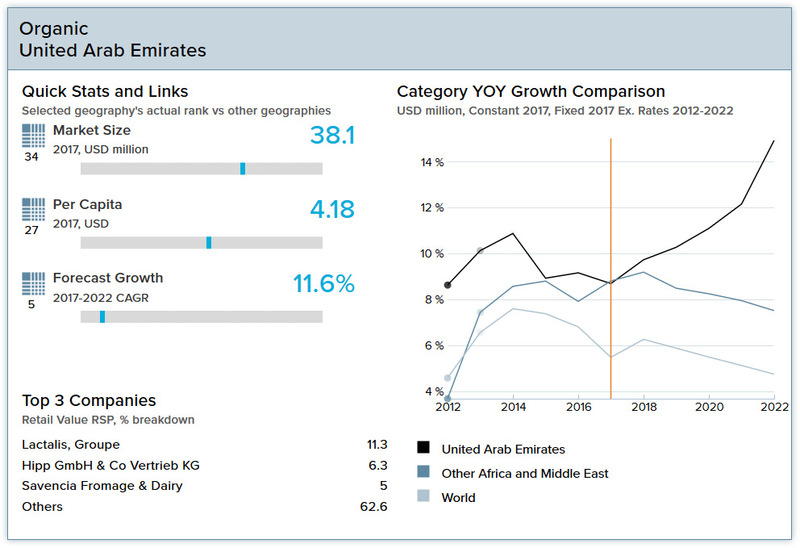 Real GDP in the UAE grew by 1.3% in 2017 and is expected to grow by 3.4% in 2018, driven by gradually rising oil prices, increased exports and investments associated with the Dubai 2020 World Expo. Dubai contributes a quarter of the country’s GDP and functions as the commercial center. The UAE economy is highly dependent on exports, acting as a re-export hub for other countries in the region. The UAE is the second-largest FDI recipient among Arab countries after Saudi Arabia. In 2017 the population of the UAE was 9.1 million, up from just 3.0 million in 2000. Expatriate citizens make up around 80% of the total population and are mainly responsible for the rapid gains in population. A large influx of immigration in recent years has also led to an imbalance between the male and female populations: There are two men for every woman in the UAE. 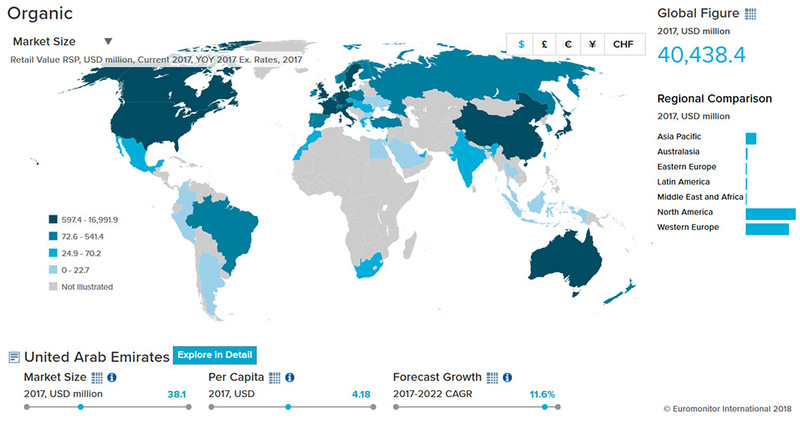 Per capita disposable income in 2017 was US$26,176, and total disposable income is forecast to grow at an annual average rate of 2.5% through 2030. In line with rising disposable income, total consumer expenditure is projected to grow at an average annual rate of 2.6% through 2030. In the 2018-2030 period hotels and catering will be the fastest-growing consumer expenditure category. The GSO standard applies to unprocessed plants and plant products, livestock and livestock products, and processed agricultural crop and livestock products intended for human consumption. A product will be regarded as bearing indications referring to organic production methods where, in the labelling or claims, including advertising material or commercial documents, the product, or its ingredients, is described by the terms “organic”, “biodynamic”, “biological”, “ecological”, or words of similar intent including diminutives which, in the country where the product is placed on the market, suggests to the purchaser that the product or its ingredients were obtained according to organic production methods. According to a 2015 Gulf News report, imports that are not certified by an organization approved by the Emirates Authority for Standardization and Metrology will be stopped at the port. All farms producing organic products must be registered and approved by the ministry. Organic products must be certified by the Emirates Authority for Standardization and Metrology (ESMA); imports must be certified by an organization approved by ESMA.